“Georgia O’Keeffe and Ansel Adams: Natural Affinities,” on view at the Smithsonian American Art Museum Sept. 26 through Jan. 4, 2009, examined the friendship of two iconic artists who were attracted to the distinct landscapes of the American southwest and far west and committed to depicting its essence with modernist sensibilities. This exhibition, the first to pair these artists, celebrated their mutual appreciation of the natural world and reveals the visual connections between O’Keeffe’s paintings and Adams’ photographs. “Natural Affinities” included 42 paintings by O’Keeffe from public and private collections and 54 photographs by Adams from the Center for Creative Photography in Tucson, Ariz., which holds the largest single collection of Adams’ work. The exhibition was organized by the Georgia O’Keeffe Museum in Santa Fe, N.M. Independent scholar Anne Hammond selected the artworks for the exhibition with Barbara Buhler Lynes, curator at the Georgia O’Keeffe Museum and the Emily Fisher Landau Director of the Georgia O’Keeffe Museum Research Center. Eleanor Jones Harvey, chief curator at the Smithsonian American Art Museum, and Toby Jurovics, curator of photography, are the coordinating curators in Washington. Georgia O’Keeffe (1887-1986) and Ansel Adams (1902-1984) met in Taos, N.M., in 1929 at the home of a mutual friend, Mabel Dodge Luhan. The two immediately became friends. The following year, they met again in New Mexico. Adams was there making photographs for his first book, “Taos Pueblo” published in 1930, and O’Keeffe was spending the first of many summers painting in New Mexico, which she made her permanent home in 1949. In 1933, Adams traveled from California to New York for the first time and met O’Keeffe’s husband, Alfred Stieglitz, the influential photographer whose modern art galleries in New York City launched the careers of numerous American artists. Stieglitz presented an exhibition of Adams’ photographs in 1936 at his gallery, An American Place, which established the younger photographer as one of America’s leading modernists. In 1937, O’Keeffe and Adams toured the southwest by car with a group of friends, visiting well-known archaeological sites including Canyon de Chelly. The following year, O’Keeffe visited Adams in Yosemite. Although their friendship lapsed in the 1940s as they pursued separate interests, the artists resumed regular correspondence in the 1950s. 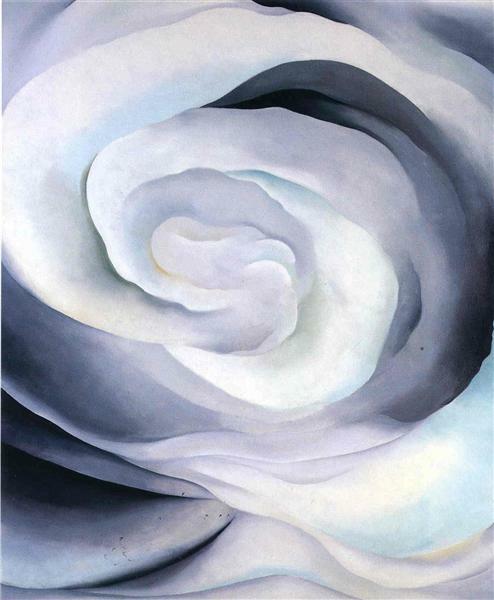 The artists last visited in person in 1981 when O’Keeffe, then 94, went to see Adams in Carmel, Calif., and Adams, then 79, visited O’Keeffe at her home in Abiquiu, N.M.
they depict their subjects extremely close-up so that any sense of the subject is lost to abstraction. and Adams’ “Leaves, Frost, Stump, October Morning, Yosemite National Park” (c. 1931). and Adams’ “Ghost Ranch Hills, Chama Valley, Northern New Mexico” (1937). 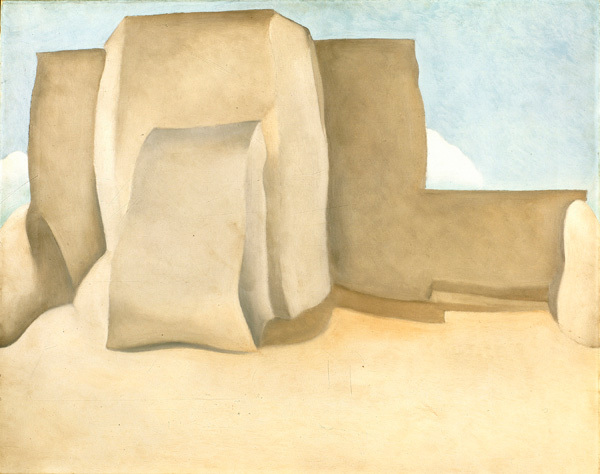 Occasionally, comparisons between works by O’Keeffe and Adams highlighted their different approaches to the same subject, such as an adobe church near Taos. the building becomes organic and seems to rise almost weightlessly from an expansive foreground. “Saint Francis Church, Ranchos de Taos, New Mexico” (c. 1929). Ansel Adams, Winter Sunrise, the Sierra Nevada from Lone Pine, California, 1944, Gelatin silver print, 15-5/8 x 19-1/4", Collection Center for Creative Photography, University of Arizona, ©The Ansel Adams Publishing Rights Trust. Ansel Adams, Moonrise, Hernandez, New Mexico,1941, Gelatin silver print, 15-9/16 x 19-11/16", Collection Center for Creative Photography, University of Arizona, ©The Ansel Adams Publishing Rights Trust. A fully illustrated catalog, published by Little, Brown and Company, features essays by Lynes, critic Richard B. Woodward and Sandra Phillips, senior curator of photography at the San Francisco Museum of Modern Art. After its presentation in Washington, the exhibition traveled to the Norton Museum of Art in West Palm Beach, Fla. (Jan. 24–May 3, 2009) and the San Francisco Museum of Modern Art (June 6–Sept. 7, 2009).